Welcome to Spud Ranch! - Texas-sized spuds for a Texas-sized appetite! "I always said I wanted to own my own ranch... NOW, I OWN TWO!" Our Texas sized spuds combined with your choice of a wide variety of toppings will surely satisfy your appetite. Stop on by! We are ready to serve! With two convenient locations, Spud Ranch has become a local favorite of San Marcos and New Braunfels. Open 7 days a week from Memorial Day to Labor Day! This Location does not currently deliver. 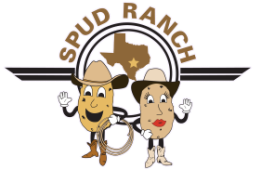 Website, pictures and content property of Spud Ranch. Graphics and website created by Visionary Blossom Graphic Design.